Do You Have A Balanced Fish Population In Your Pond? Home > Blog > Aquatic Animals > Do You Have A Balanced Fish Population In Your Pond? 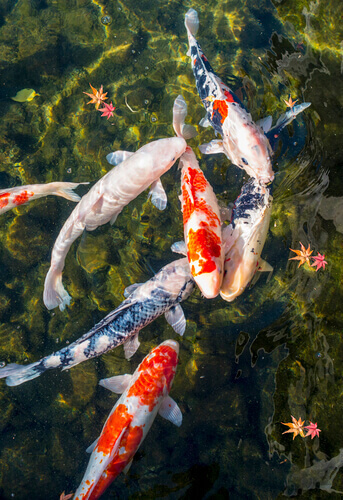 Having a balanced fish population is important for ponds and water gardens. Every pond owner should have a good approximation as to the number of fish which are present at any given time, but doing so requires special equipment and a bit of knowledge. A fish trap is a nifty device that can be used to capture fish, as well as turtles and even muskrats. It gives you an option for population control while allowing you to treat the animals humanely. The best models are constructed with galvanized steel. Once you have fish in the trap you can then sample them for population size along with other factors. At some point the fish population in your pond will fall out of balance, either because of too little fish or too many. An excessive amount of fish will rapidly degrade the water quality which can result in the spread of disease and overall decline of the pond. There are a number of things you should be on the lookout for when you sample your fish. For instance, if you notice that mostly predatory fish like the perch and bluegill are being caught in the trap, this means that there is a strong likelihood that the pond is overpopulated with fish that are predatory. You could solve the problem by adding other fish which are prey on them, such as bass, to keep things in balance. A balanced pond is one that has an even distribution of fish which are roughly the same size, with a ratio of about three prey fish for every one predator. One technique that some pond owners use is to place feeder minnows on one side of the pond so the larger fish are attracted to it and then place smaller fish on the opposite side so they have a chance to hide from the bigger fish. It is important to ensure the habitat is good for fish, especially the smaller ones that share the water with larger species. One way of doing this is through fish attractors. These devices will enhance the spawning environment while improving the rate of survival for younger fish. They are designed in such a way where they provide an environment which is simple to deploy and highly durable, not deteriorating due to underwater conditions. Additionally, the size of a fish attractor can be modified simply be altering the pipe length that is used. If you are working with fish that are fond of shallow water, you can use the piping to create what appears to them to be a stump. For water which is deeper it is recommended to use extended pipes so you end up with a complete tree attractor. You have a lot of options in the manner in which these devices can be deployed.